Mae Kuna, age 93, reposed on Wednesday, July 4th, 2018 in Holland, Michigan. She was born in Jackson, Mississippi on May 20, 1925. Mrs. Kuna was a long time resident of Holland. She met her late husband Luke in Holland while visiting her sisters and fell in love. They were married for 55 years. 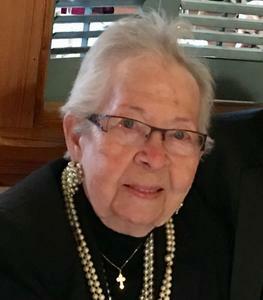 She was very active and involved at Saint George Antiochian Orthodox Church in Grand Rapids, Michigan where she was a member of the ladies Golden Links Society. Mae was socially active with her loving friends at the Village at Appledorn where she lived independently for the past 8 years. Mae owned and operated her own hair salon for over 40 years. She was preceded in death by her loving husband Luke in 2008; infant daughter, Kellie Jean in 1959; brothers and sisters. Mrs. Kuna is survived by her son, Gregory (Tamara) Kuna; daughter, Patricia (Denis) Tabachuk; two granddaughters, two great grandchildren and many nieces and nephews. Visitation will be from 2-4p.m. and 6-8p.m., Sunday July 8, at the Dykstra Funeral Home – Downtown Chapel, 29 East 9th Street, Holland. A funeral Ceremony will be held 11:00a.m. at Saint George Antiochian Orthodox Church, 334 La Grave Ave SE, Grand Rapids, MI. Father John Winfrey to officiate. Interment will be in Pilgrim Home Cemetery. Memorial contributions can me made to Saint George Antiochian Church in Grand Rapids. Professional services were entrusted to the Dykstra Funeral Home – Mulder Chapel.